My first story for Le Monde, the one about the pogrom survivors in Romania, was published in January 2011. Shortly after that, they contacted me and asked me if I was interested in working on a new project, this time in India. That is how, in late February, I ended up in Ahmedabad (Gujarat). After finishing my work, I continued my Indian trip and headed for the animal fair in Nagaur. For this I had to fly to Jodhpur first and then travel by car. Once I arrived in Jodhpur I took a cab from the airport with a clear intention of driving straight to Nagaur. Since the trip was going to last at least 4 hours, I thought to myself it wouldn’t hurt having a bite before leaving. I asked the driver if he knew any good restaurant in the neighborhood and he recommended the Umaid Palace, somewhere near the airport. I was reluctant to trust his taste, but I was too tired and in a hurry to give it much thought. I had barely arrived at the palace gate, when I realized that I had worried for nothing. Not only was the Umaid Bhawan Palace an extraordinary hotel, but it was also the home of the Jodhpur Maharajah. At the entrance we were greeted by the palace guards. We first thought it was just a routine check-up. However, they asked if we were guests of the hotel and when we said we were not, they replied that only guests were allowed in. I thought I was not hearing right and asked him to repeat and about mid phrase, when it became clear to me that I had understood right in the first place, I felt my blood pressure rising. I kept my cool and asked to speak to someone responsible for this policy that I had never had the chance to experience before. He called someone on the phone and after presenting the person at the other end with the situation in short, he put me on. Quite irritated, I introduced myself and expressed my dissatisfaction with the fact that I was standing at the entrance of a five-star hotel and was not allowed to have lunch just because I was not a guest. To my complete and utter surprise I was explained that the hotel was an expensive one and they had many situations in the past when people failed to pay for their meals, which is why it was decided to enforce this policy. After a dialogue that seemed endless to me, I heard him say he could make an exception and told the guards to let me in. Had I not been in such a hurry and so outraged, I would have asked the driver to take me to another restaurant. Instead, I decided to stay and entered the hotel. Except for the personnel on duty, there was not a single soul. I was the restaurant’s only client. The food however, was extraordinary, that is why I ceased beating myself up for insisting to eat there. Before leaving I asked to speak again to the man who allowed me in, to thank him and tell him that perhaps it wouldn’t be such a bad idea to review this inhospitable policy, to say the least. We met in the hotel’s grand lobby. We were chatting for quite a few minutes now when he sprung to attention while a man of rather old age, grey haired and with a thick mustache crossed the lobby. He said to me in a low voice: “this is the maharajah…” Less than a minute after the maharajah’s entry, a few Buddhist monks followed and right after them the Dalai Lama himself stepped into the lobby. Gaj Singh, the maharajah, was there to greet and say good bye to the Dalai Lama who had been his guest during the few days visit to Jodhpur. This had been the reason why my access to the hotel was first refused. Right after being greeted by the maharajah, the Dalai Lama stepped in my direction, offered his hand and greeted me. He asked me where I was from and when I said Romania, he expressed his regret for never being welcomed to our country, given our close relationship with the Chinese government. He then asked me what brought me to India. I told him that I am working on a story about faith, trying to point out that despair various religions the emotions of our believes makes us all the same, and in India I was documenting the reconciliation after the conflict between the Hindus and the Muslims, which in the early 2000s led to a few thousands of victims, and that meeting him, a symbol of reconciliation and peace, was a divine sign for me. He replied that India was a miraculous place where all religions and beliefs coexisted. I asked for and received his permission to take a few pictures of him. Since my equipment was in the car I told the manager that this was a good time to make up for my trouble and urgently bring my car in front of the hotel. I have no idea how they managed to do this, but in just a few minutes the car was there, waiting for me at the entrance… I took my camera and got back to the lobby. The Dalai Lama was being photographed with the hotel staff. When he saw me with the camera he put his palms together and greeted me… I accompanied him with my camera to the hotel exit. Somewhere, on my right, more than 100 meters away from the hotel steps, a few tens of people had gathered to see him. He then got in the car and greeted me once again. This is my story about how I met the Dalai Lama. Given the force of his kindness, it is no wonder that the hatred of billions of Chinese did not reach him. 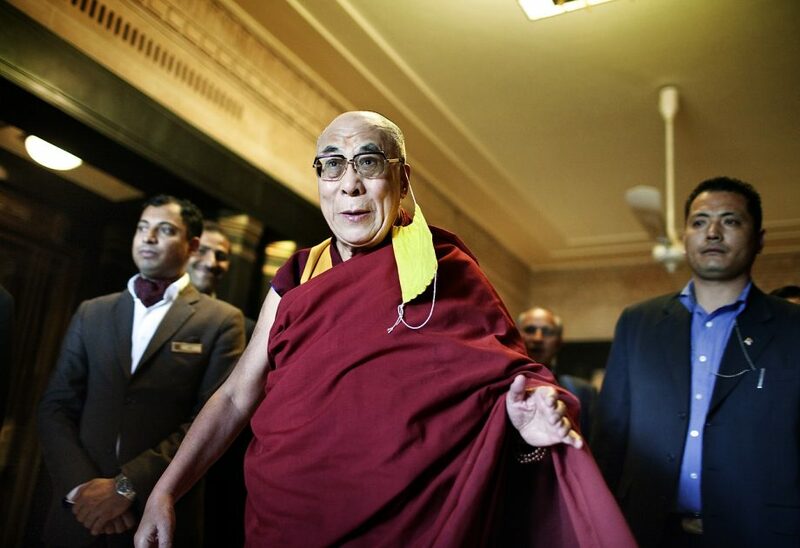 The Dalai Lama seen leaving the Umaid Bhawan Hotel in Jodhpur, February 10, 2011. Tibetan spiritual leader the Dalai Lama was the guest of the erstwhile ruler of Jodhpur Gaj Singh and is staying in the royal residence Umaid Bhawan Palace. This is the first visit of the spiritual leader to Jodhpur, during which he delivered lectures on different subjects on February 9 and 10, 2011. 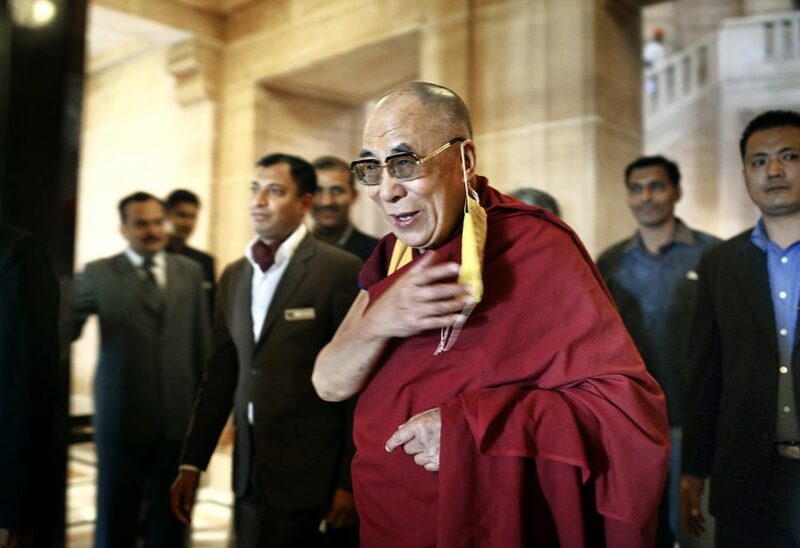 Tibetan spiritual leader the Dalai Lama is the guest of the erstwhile ruler of Jodhpur Gaj Singh and is staying in the royal residence Umaid Bhawan Palace. This is the first visit of the spiritual leader to Jodhpur, during which he will be delivering lectures on different subjects on February 9 & 10. 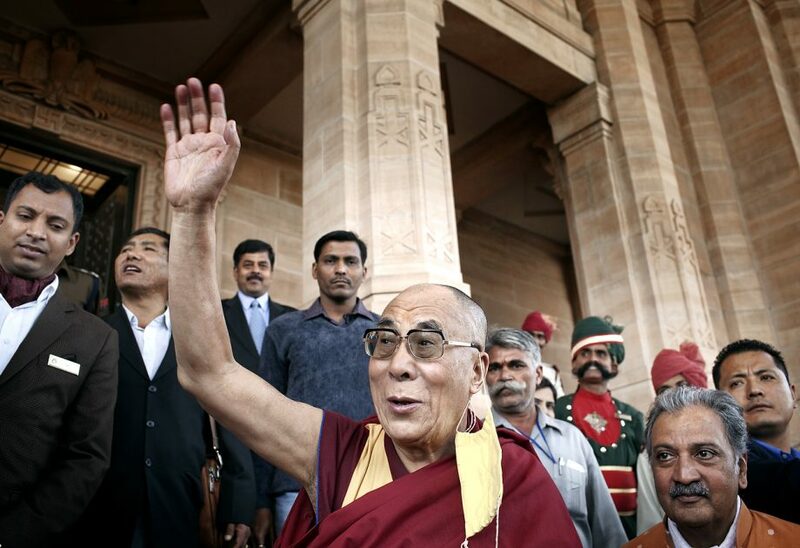 The Dalai Lama seen leaving the Umaid Bhawan Hotel in Jodhpur, February 10, 2011.